Area : 2579 sq. kms. An old seaport on the banks of Ashtamudi Lake, Quilon, 72 km away from Thiruvananthapuram is also known as the gateway to Kerala. The district is fairly important for the State's trade and commerce and is the centre of the country's cashew trading and processing industry. It is also an important hub for the State's marine products industry, with the port of Neendakara being the centre for trawlers and ice plants. Throbbing with industrial activity, Quilon is a place where nature can be seen at its best. People from places as far as Persia, Arab, Rome and China traded here. The Portuguese were the first Europeans to set up a trading centre followed by the Dutch and British. A perfect blend of modernism and antiquity, the developed city of Quilon brings to the fore the memories of a bygone era. Quilon, which is a veritable Kerala in miniature is gifted with Kerala's very representative features - sea, lakes, plains, mountains, rivers, streams, backwaters, forest, vast green fields and tropical crop of every variety both food crop and cash crop. » Thangassery (5 km) - A seaside village of historic importance, with the ruins of an old portuguese fort and a few 18th century churches strewn all over, Thangaserry is a city located 5 kms from Kollam. One of the main attractions of the place is the Light House at Thangaserry, which is 144 feet high. » Mayyanad (10 km) - The place is primarily noted for its shrines and temples, the most important of the nine temples being the Subramanya Temple at Umayanallor. » Karunagappally - Karunagappally is situated 27 kms. north of Kollam. It is linked with Kollam by rail and road. An idol of Buddha, recovered from a local tank here, is now preserved in the Krishnapuram Palace, situated north of Ochira. The town has a temple dedicated to Lord Siva, two old mosques and a Mar Thoma Church. » Kottarakkara - Kottarakkara, the place from where the famous Indian classical dance form originated is the headquarters of Kottarakkara Taluk. 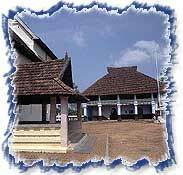 It was once the capital of Elayadathu Swarupam, a principality ruled by a branch of the Travancore Royal Family. » Thirumullavaram Beach (6 km) - An ideal picnic spot, it is a secluded beach, well connected by frequent bus services. » Rameshwara Temple - The influence of the pandyas is manifest in its design having inscriptions in Tamil, dating from the 12th to the 16th centuries. The Vyala monster sculptures in this temple give one the impression that the creatures are animated and actually climbing up the stairs with their outstretched paws. » Kottukal Rock Cut Cave Temple (11 km) - It is a magnificent temple, situated on the Thiruvananthapuram - Kottayam MC Road. » Picnic Village - Located at Ashramam, along the backwater front, picnic village is the main centre of recreational activities in Kollam. A 200-year old Government Guest House and Adventure Park, a Tourist Boat Club, a Children's Traffic Park and a Yatri Nivas are all housed in this vast tourist complex. » Jatayupara - A huge rock at Chadayamangalam, Jatayupara takes its name from the mythical bird Jatayu in the epic Ramayana, who is believed to have collapsed on the rock after failing in his attempts to thwart Ravana's kidnapping of Sita. The Crafts Festival is held annually during December-January, featuring the work of craftsmen from all over the country. The enchanting backwater destination of Kumarakom is a small village that is a cluster of little islands on the Vembanad Lake in Kerela. Kumarakom strengthens Keralas reputation for being Gods own country with its unbelievably beautiful mangrove forests, coconut groves and emerald green paddy fields interspersed with enchanting waterways and canals adorned with while lillies. It is part of the Kuttanad region, and the bird sanctuary here spread across 14 acres of any ornithologist's paradise. This enchanting backwater destination offers visitors many leisure options. From wandering into the depths of its wildlife sanctuary to cruising down the back waters and fishing, Kumarakom is perfect for a lazy and laid back holiday. The best way to watch the birds of the Kumarakom sanctuary is a boat trip round the islands, as hundreds of swaying verdant coconut palms lining the rivers lean to brush the tops of your heads. Kumarakom is an example of nature at her bountiful best in the fragrant flowers, the riot of multi coloured birds, the surrounding greenry and the clear waters. » The Vembanad Lake - The Vembanad Lake is one of the largest fresh water lakes in Asia. 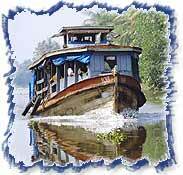 It flows through the verdant lands of Kerala and offers one of the best backwater cruises. Most of the flora and fauna in this region flourishes around this supply of fresh water. The lake also acts as a balancing tank against floods, and its wooded banks, temptingly invite a visitor to explore more. The boats that ply on the lake vary from the large stitched-hull, cargo carriers with domed mat-roofs to houseboats. » The Water-bird Sanctuary - A water-bird sanctuary lies at the edge of the grounds of an old estate where a profusion of all kinds of birds can be observed. Domestic birds such as cuckoo, wild duck, egrets, darters, herons, teal, and water fowl can be seen in abundance here, as much as can the Siberian storks which migrate to this area each year. 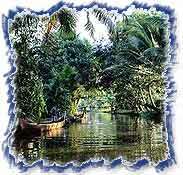 » Kottayam - Kumarakom is situated 15 km from Kottayam on the Vembanad lake. This little backwater town is well known for its rubber plantations. Christianity is the dominant religion here and it is dotted with pretty old churches. Rejuvenating ayurvedic massages are available here. Thekkady, a major wildlife center lies 114 km from here, and Sabarimala, a Hindu pilgrim center is another 134 km from Kottayam. » Alappuzha - The charmingly unkept coastal town of Alappuzha, formerly called Alleppey, lies close by. With its labyrinth of canals, bridges, silver beaches, and cheerful people it makes for a memorable holiday. Alappuzha is a never-ending panorama of lush green paddy fields, towering coconut trees, and long canals that offers enjoyable boat cruises to Kollam along the scenic Vembanad Lake. Kumarakom is best described as a picturesque clean village like most places in Kerala. It has lately become a preferred tourist destination. Boat races, houseboat cruise, canoeing and fishing are some of the main attractions of this simple place. The huge houseboats, traditionally known as the Kettuvalloms, are complete with living rooms, toilets, kitchen, balcony for angling and it is possible to live on them for days together for a truly unique experience. These Kettuvalloms are actually remodelled cargo barges made of wooden planks joined together by rope only, without using nails at all. Kumarakom lies in the region of Kuttanad, which is the rice bowl of Kerala. Here farming is done below sea level. The peace and quiet, biting fresh air and unspoiled life style of the simple people of Kumarakom are a unique and rejuvenating experience that surpasses any modern entertainment activity or pastime. The nearest airport is the Cochin International Airport, which is about 76 kms from Kottayam town. Kottayam is the nearest railhead to Kumarakom, about 16 km away and provides a link to all major cities in Kerala and India with numerous trains plying its route daily. The nearest bus terminal, is also at Kottayam. We offer complete travel and tour packages to the beautiful backwaters of Kumarakom that are inclusive of hotel booking, air booking services as well as cab and car hire services for the entire duration of your stay there. Our Kumarakom tour packages are irresistible and cost effective travel options that offer you the holiday of your lifetime! Kumarakom is located on the Southern coast of India enjoys a well-balanced tropical climate. 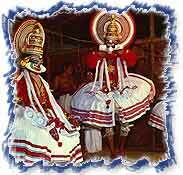 The local spring season emerges from August and coincides with the harvest festival of Onam. The lowest and highest temperatures recorded are 16.10 C and 37.80 C. There is always a cool, fresh breeze, which makes even the warmest weather readily agreeable. The South West monsoon is from early June to early August. However, slight drizzles persist till early November. Average rainfall is 1100 mm per year. The peak tourist season is from November to March.